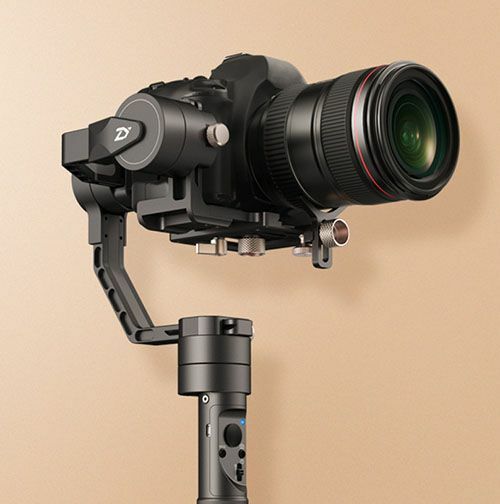 All-in-one Design: Come with a camera control cable that can realize synchronous operation on both your camera and stabilizer like taking a photo or zooming, direct camera control achieved. 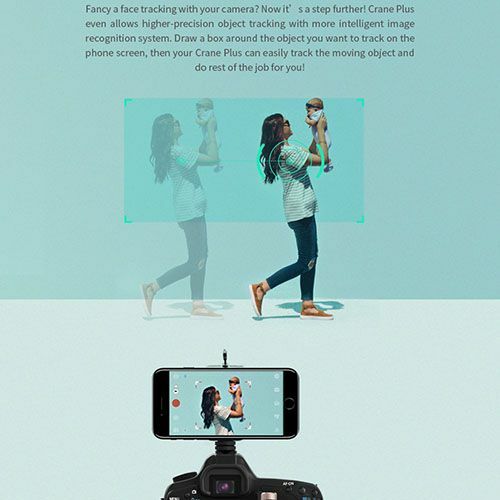 Intelligent Object Tracking: Smart follow, allows higher-precision object tracking with more intelligent image recognition system, supports object-tracking via phone app control. 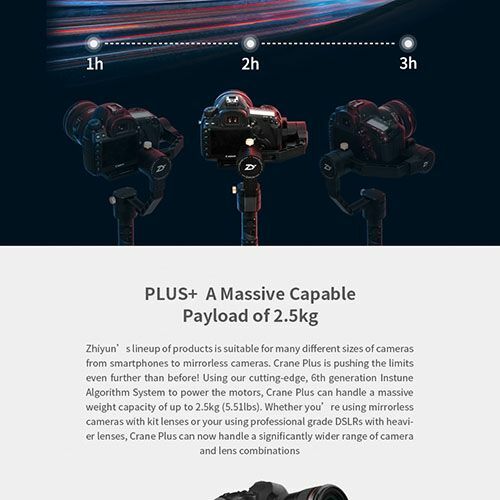 2.5kg Massive Cable Payload: Able to handle a massive weight up to 2.5kg (5.51lbs). No matter using mirrorless cameras with kit lenses or using professional grade DSLRs with heavier lenses. Can handle a significantly wider range of camera and lens combinations. POV (Point of View) Mode newly Design: Allows for additional camera movement by providing up to 45 degrees of synchronous motion on the roll axis. 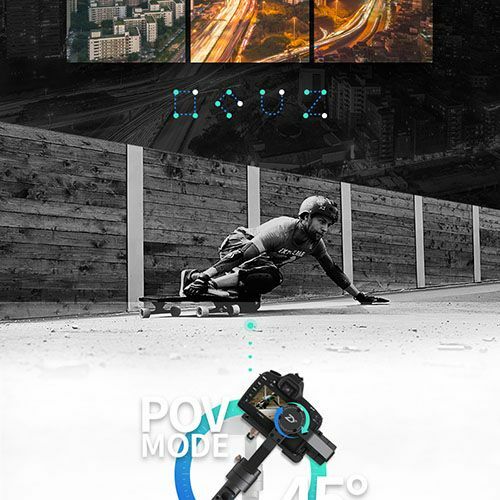 POV mode will move with you and roll your camera left or right, up to 45 degrees, give you the level of control and freedom you need to capture almost any shot possible. Motion Memory: Allows you to setup advanced camera movements and save them so Crane Plus will remember them for the future. It will even remember all of your time lapse settings like the interval, number of shots, duration, and more! 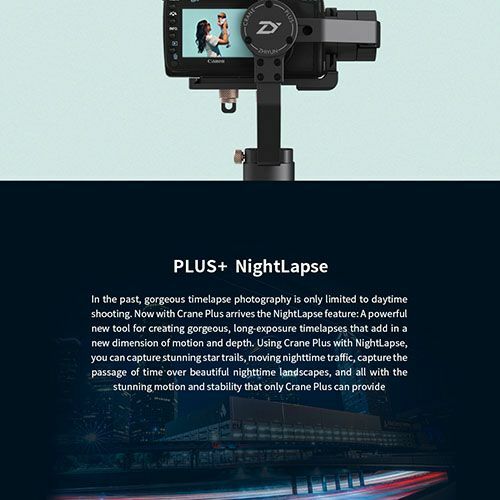 Powerful Night Lapse: To capture stunning star trails, moving nighttime traffic, the passage of time over beautiful nighttime landscapes, and all with the stunning motion and stability. Full Set of Accessories Provided: With anti-slip grip tape, Camera Cables for controlling. 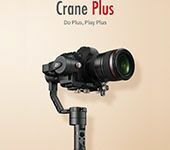 Compatible Camera aluminum tripod for setting your Crane Plus down and using as an extended grip.